What We Need for the February 18th Giveaway! Hi everyone! There’s just eight short days until the February giveaway! We have a fairly long green light list on our What Do We Need page this month, but are only completely out of four items: insect repellent, toothpaste, men’s underwear, and nail clippers. Check out the price drop on the toothpaste that’s on our Amazon wish list! Wow! 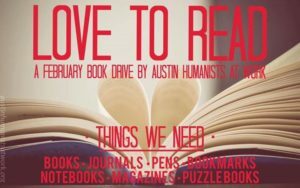 Eight days until the February giveaway also means that there’s only eight days left in ATXHAW’s 2nd Annual Love to Read Book Drive! We’re collecting books, journals, puzzle books, bookmarks, pens, and magazines to give to our fellow bookworms. Do you have some books (or other items) that you’d like to get to us? Great! Please visit our Donate page to find the best way to get your items into the hands of those that need them. Cold Weather Shelter Volunteers Needed! St. Andrew’s Presbyterian Church needs volunteers to help on nights when the Cold Weather Shelter system is activated. The Cold Weather Shelter system is a network of churches and community volunteers that provide extra shelter space on nights where the temperature falls below freezing. Dinner volunteers are needed from 6 PM to 9 PM, and overnight volunteers are needed from 9 PM to 7 AM. If you’d like to volunteer, please contact Ed Kopas at edwardkopas@yahoo.com or 512-659-9880. 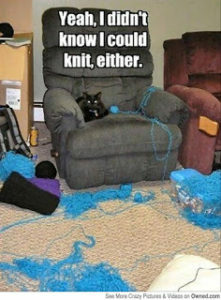 If you’ve recently discovered your hidden knitting (or crocheting) talent, come join the ATXHAW Gettin’ Knotty group! GK volunteers create cotton washcloths, which are handed out year-round at ATXHAW giveaways, and hats & scarves, which are handed out during the cold weather months. Gettin’ Knotty will be meeting this Thursday, February 15, at Barnes & Noble in the Arboretum. Creating begins at 7 PM and wraps up at 10 PM. If you knit or crochet at home, you can drop off your donation at the GK meeting. Thanks for reading! Have a happy and safe weekend. See you on the 18th! ← Announcing ATXHAW’s 2nd Annual Love to Read Book Drive!